As the area’s most recommended flooring showroom, Andros Floor Design is the place to find a full variety of wood tile flooring. Today’s production techniques allow us to offer you beautiful ceramic tiles that duplicate the color and graining of real wood. Turn to us for wood-look tile in Santa Barbara, CA, a flooring solution that lets you make the most of your remodeling budget. These eye-catching floors give you the timeless look of genuine wood, and they are perfect for virtually any room in your home or office. When you come to our showroom, our knowledgeable and friendly associates will guide you through our collection of ceramic wood tile. We will make sure you get the alluring home flooring that matches your interior design goals. Wood tiles are an increasingly popular flooring style among local homeowners because they offer distinct advantages and unbeatable value. As gorgeous ceramic or porcelain flooring that looks like natural wood, our tiles have remarkable design versatility. However traditional or modern your preferences may be, there is a wood-like tile that will work for you. What’s more, this material is sturdy, resilient, simple to clean, resistant to moisture, and difficult to damage. If you have a busy household, ceramic wood tile is no-fuss flooring that looks as good as new for many years to come. 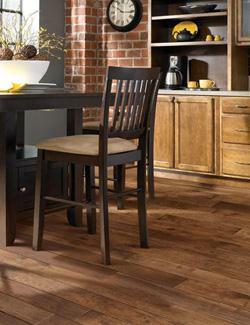 Available in many wood grains and shades, these tiles are a cost-effective way to update your indoor spaces. Our products come in a variety of styles, including imitations of various woods, so you’re sure to find your new favorite flooring at our showroom. Once you do, we continue to support your home improvement project by offering the services of our professional installation team. We make sure your new flooring is quickly but correctly installed for a lifetime of reliable use. You can’t go wrong with a porcelain wood tile, and our experienced professionals make your home remodeling project a stress-free experience. The products at our store are manufactured by some of the most trusted brand names in the industry. We want our customers to know that they are purchasing tough, durable flooring that will stand the test of time. We are committed to each customer’s complete satisfaction, and that means selling the finest home flooring at the most competitive price. For beautiful wood-plank tile and professional flooring installation, turn to us for the brands and expertise you can trust. We’re prepared to make your home remodeling dreams a reality, whether you’re interested in ceramic wood or carpet. Contact us for more information about wood floor tiles. We proudly serve customers in Santa Barbara, CA.